Are you victim of routine? Do you feel like your career isn’t moving? Maybe it is time to refresh your career. In episode 99, our hosts Kristine D’Arbelles and Julia Kent take inspiration from IABC’s Communication World. In the March issue, IABC interviewed Mark Schumann who talks about the three Ds to ensure his career and communication functions move forward: diagnosis, development and delivery. 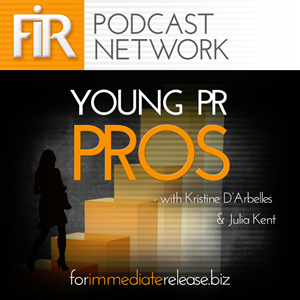 Kristine and Julia look at refreshing your career through two lenses: moving on to another opportunity, or refreshing your current role. The answer isn’t always jumping to a job that pays more, sometimes you can refresh your career by making change within your own organization. Don’t forget, the next episode is our 100th episode. We have a special surprise in store for you. The surprise might involve a new voice. And this is a voice you do not want to miss. Also, Young PR Pros will be sponsoring the uOPRA conference Connect 2 Success. If you are attending the event, be sure to stop by and say hi to our host Kristine. Kristine will be appearing on a panel called Getting Started in the Field, as well as interviewing key speakers. We will be asking speakers to give us an example of the most impressive PR or communications move they have ever seen. We will share their responses and all our interviews over the coming months. This is the second time we participate at the uOPRA conference, check out the interviews with last year’s speakers here. Young PR Pros is brought to you with Lawrence Ragan Communications, serving communicators worldwide for 35 years. Information: www.ragan.com.